Sermon for Pentecost 14: "Traditions and Commandments"
Everyone has traditions. If any of our family stops in or around Tillamook, OR, we go to the cheese factory. When you’re at a baseball game you sing “Take Me Out to the Ballgame” at the 7th inning stretch. Towns like Milton have memorials to honor the service and sacrifice of our military. The word “tradition” means something handed on from one person or from one generation to the next. Like the baton in a relay race handed on cleanly to the next runner. The Christian writer G.K. Chesterton called tradition the “democracy of the dead.” If all we do is focus on the present moment we have no regard for the past. In keeping the traditions, our past becomes our present. You might think of tradition as a vehicle, a means of bringing the past into the present and handing on what is most valuable and important, sort of like a moving truck from California to Milton, WA. Now imagine, as you’re on your summer road trip through Mt. Shasta or the Olympic National Forest but you never look out the window of the car except at the road ahead. All you stare at are the dials and dash lights of the car, or if you’re in the backseat, the drop-down DVD player. And you never see the snow-capped mountains or the lush green of the forest around you. All your attention is on the vehicle. That’s crazy, isn’t it? Why bother with the gas and the trip? Why not just sit in the driveway and admire your car? That’s what happens when tradition takes over. Traditions can be good, but they can go bad too. Like when we forget why we have a certain tradition and all we say is “Well, it’s always been that way.” Or worse yet, when our traditions lead us away from or become more important than God’s Word. This is what happened with the Pharisees of Jesus’ day. They were steeped in tradition – 613 things to do and not do in order to do the righteousness of God. Washing hands and feet and dishes and cushions, not just for personal hygiene but for ceremonial purity. And like all religious types, they took note who followed the traditions and who didn’t. Who washed their hands and cups and saucers and who didn’t. They pointed it out to Jesus when His disciples dared to eat with ceremonially unclean hands. Jesus illustrates his point with the 4thCommandment: “Honor your father and mother,” which also includes taking care of them when they’re old and providing for them. But the tradition of the Pharisees said that if you declared a portion of your wealth to be “Korban,” which was like sacrificing it in advance, then you didn’t have to use it to help your parents. And God was supposed to be pleased with this, because the sacrifices were for Him in the end, so how could He possibly not like that? What’s the problem? The problem is thinking God needs our sacrifices. That’s not Christian. It’s pagan. Keep the gods fed and liquored and happy. It doesn’t work that way with God. He doesn’t need or want anything from us but faith. That’s all He wants. Faith. Trust in His Word and promises. And the faith he wants us to have, he gives as free gift. “I desire mercy not sacrifice.” He says it all over the Scriptures. Jesus repeated it to these same Pharisees. I desire mercy not sacrifice. Mercy to the neighbor in need. Mercy to mother and father. Mercy to the broken stranger in the ditch. Mercy to the least and lost and lowly. Mercy to sinners. Forgiveness to those who have wronged you. Mercy even to those who hate you and revile you and persecute you. Lip service to God, that’s easy. Just say go through the motions. But mercy to those whom God has placed in your life, not so easy. Faith toward God, fervent love for one another. That’s what He desires. Faith-full hearts from which flow with mercy and love toward others. When we elevate tradition over God’s Word rather than a servant of God’s Word, we become preoccupied with what we’re doing for God rather than what God has done and is doing for us. Take worship for example. Worship isn’t about what we do for God. It’s about what God in Christ is doing for us – forgiving us, washing us, feeding us. His Word, His Baptism, His Body and Blood. It’s not about our making ourselves pure. We can’t. A sinner cannot purify himself from Sin. Cleansing must come from outside, from above, from the Son of God who became our Sin in our flesh and died our death on a cross. That’s the focus of worship. Not in our hearts, not in ourselves, nor in what we do but in Jesus and what He has done. Prayer, praise, thanksgiving, worship, and tradition are good. And God delights to hear from us as a loving Father delights to hear from His children. But we worship isn’t about us pleasing God; rather, we pray, praise, and give thanks because in Christ we are pleasing to Him. With all their religious rules and regulations, ritual washings, and traditions, the Pharisees missed the one needful thing. Jesus. They missed God’s mercy in Jesus. They missed the cleansing that all their washings could not work. They missed the most wonderful thing God has ever done, and will ever do, for the world – the sending of His beloved Son in the flesh to be our savior. They were like noisy patrons at a comedy club, so busy talking to each other, they missed the punch line and didn’t understand why everyone around them was laughing. They were so busy with their traditions, with their religious dos and don’ts, they missed the great good news that Christ came to save sinners not saints. That He came to redeem sinners not the redeemable. That He came to raise the dead not the living. We would have missed it too. We focus on our hands rather than the hands of God. We focus on our doing rather than God’s doing. We focus on what we think God wants from us rather than what God says He wants from us – mercy not sacrifice. For we are all Pharisees in our sinful hearts. And just like the Pharisees, the problem isn’t with tradition, it’s with us. We make idols for ourselves and think it’s our sacrifices that save us. But we’ve got it all backwards. The only sacrifice that matters is the One Jesus offered in obedience to His Father. The only offering that can be held before God is the offering of Jesus’ life for your life. Jesus let his hands become defiled and hooked with nails to a beam of wood for us. Jesus endured a horrible human tradition of condemnation and execution on a cross to give us a true washing of rebirth and regeneration that cleanses our defiled hearts. Special note of thanks to the blog of Rev. William Cwirla for the ideas and outline of this sermon. I get by with a little help from my friends. Sermon for Pentecost 13: "You Are What You Eat"
You are what you eat, my parents would say when I was a child, as I (with delight) and they (with disgust), watched me devour a box of nerds, airhead candy, or a package of smarties. Silly as it sounds, there’s a grain of truth baked into this old saying. “You are what you eat.” The fruits, vegetables, proteins, and nutrients we eat and drink affect our bodies, they sustain our physical life, satisfy our needs, and keep us alive. “You are what you eat” is true of our Christian life as well. We live in a world where “Have-it-your-way Christianity” and Happy-Meal-Theology is far more popular than a steady, solid diet of hearing, singing, and praying the Scriptures and receiving Jesus’ body and blood in the Lord’s Supper. Thankfully, like loving parents feed their kids what is good and healthy, our Heavenly Father knows best what we need and how best to satisfy our hunger and thirst for righteousness. We do not need catchy slogans, but salvation. 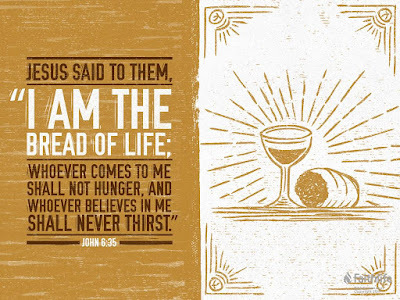 Whoever feeds on my flesh and drinks my blood has eternal life, and I will raise him up on the last day. For my flesh is true food, and my blood is true drink. According to Jesus, there are two kinds of food. The food of death. The food of life. Bread that’s gathered from grain, baked, and eaten - all of which takes hard work. And there’s Jesus, the Bread of Life, given to us free of charge, by grace in Christ Crucified and Risen, not our work but his work for us. If the Jews weren’t angry with Jesus before, they were after hearing that. “How can this man give us his flesh to eat”? Is Jesus proposing that his followers turn into cannibals? No. Perhaps, then, he’s speaking figuratively? But how can that be? Jesus doubles down on the fleshly language. Eat. Drink. Jesus’ language is far too earthly, ordinary, and tangible to be a metaphor or a symbol. After all, metaphorical food won’t satisfy, and symbolic drink won’t quench thirsty souls. We are flesh and blood creatures and Jesus is our flesh and blood Savior. It’s more likely, in fact, that the Jews were upset not because they misunderstood what Jesus was saying, but because they understood him all too well and didn’t like it. The feeding of the 5000 in the wilderness. The healings. The teaching of God’s Word with authority. It all sounds rather Moses like. And yet Jesus claims to be greater than Moses. As the living Father sent me, and I live because of the Father, so whoever feeds on me, he also will live because of me. When Jesus declares he is the Bread of Life, he’s saying that he is the God of Israel who can and will prepare a new table in the wilderness for his people. He will feed, provide, and save in his own body and blood broken and shed on the cross. They took offense at him. Grumbled, just as they did in the wilderness in Exodus. Do we take offense Jesus’ words too? If we’re honest, we have, and we will. Sometimes Jesus’ words upset us because we misunderstand them. Other times, however, it’s because we don’t like the truth his word reveals about us. For His Word reveals all our hidden faults like a menu exposes all the hidden calories on the plate before us. That we were darkness, foolish, and dead in our trespasses. His word is a warning label against the devil’s Turkish delight, which he constantly wafts before us, tempting us with whatever is pleasing to our eyes and sinful desires. Our Lord takes his word in hand, like a master chef with his blade, and exposes our sinful heart that constantly looks inward and outward for satisfaction in anything and everything other than God’s promises. Yes, our Lord’s word kills, but it also makes alive. Jesus feeds, forgives, and fills us with his Word of absolution, his word and water in Baptism, his word with the bread and wine, our Bread of Life, true Manna from heaven. Flesh. Blood. This is sacramental language too. In bread and wine, the Creator comes to his creatures to feed, satisfy, and save us. Jesus the Bread of Life gives us living bread and true drink in his body and blood. Whoever feeds on this bread will live forever. Jesus took all our sin into a cup - every grumble, complaint, hurt, pain, sorrow, suffering, all our offenses - and he drank it down to the last drop on the cross. Jesus let the grave swallow him whole, only to be spit back out again three days later like Jonah out of the belly of the fish. His crucified and risen flesh and blood are true food and true drink. Jesus uses the food of the fall - bread - fills it with his own body and redeems, restores, and rescues us. Jesus, who tasted death for us, takes the fruit of his cross - his perfect life and perfect death - and gives his body for the feast; gives his sacred blood for wine...oh taste and see that the Lord is good. In this Sacrament, we partake of a grand, yet gracious mystery. We eat and drink the body and blood of Jesus who knew no sin yet became sin for us. Jesus consumed all that we are, our sin and death on the cross, so that in this Supper we receive all that he is: his grace, forgiveness, life, and salvation. In this sacred meal, we truly are what we eat: Forgiven. Saved. Alive forevermore. Sermon for Pentecost 12: "The Bread of Life"
Lately, my children have been playing a little word game. It goes something like this. Do you like chocolate? Yes. Do you like peanut butter? Yes. Then you must like them together! Now, the book of Exodus doesn’t tell us, but maybe Israelite children played similar games with their parents in the wilderness. Do you like Manna? Yes. Do you like Quail? Yes. Then you must like them together! This little game fits in well with today’s Scripture readings too. Do you like food? Do you like God’s Word? Then you must like them together! Indeed, God joins his gift of food and Scripture together all the time. Remember how Ezekiel and John ate the scroll of God’s Word. Or how Jesus was known for eating and drinking with sinners. Or how we pray that we would read, mark, learn, and inwardly digest God’s holy Word. Everywhere you turn in Scripture, there’s a feast of God’s gifts. To Adam and Eve, the Lord declared: Behold, I have given you every plant yielding seed that is on the face of all the earth, and every tree with seed in its fruit. You shall have them for food. Whether it’s in the garden or the wilderness, under a broom tree for a fearful prophet or in an upper room of fearful disciples, Old or New Testaments - everywhere you go in Scripture, God is with his people. Giving daily bread. Slaughtering the fattened calf for prodigals. Gathering us to his banqueting table. Last week we heard that Jesus gives us Living Bread from heaven. 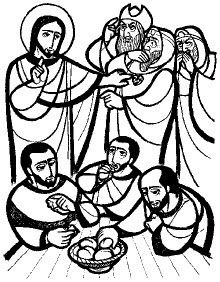 Today we hear that Jesus is the Living Bread. We’ve all been hungry before. We walk to the fridge or cupboard and say to ourselves, “I’m hungry, but I don’t know what for.” Hunger is the absence of bread, food. Thirst is the absence of drink. We need food and drink to live. Like the Snickers bar commercial says, “You’re not yourself when you’re hungry.” We get cranky, tired, weak, 21 days without food. 3 days without water. Eventually we die. And what’s true in our daily life, is also true of our life before God. Sin leaves us with a feeling of hunger that can’t be satisfied, a thirst that can’t be slaked, and an emptiness that no matter how hard, and how full we try to fill it, the hole just keeps getting deeper and darker. We’re like Adam and Eve, desiring what is pleasing to our sin-warped eyes; we delight in our own wisdom or strength, or we pride ourselves on not being proud like those other sinners. We think we know best what we need, not what God gives. We’re like Israel in Egypt, enslaved to sin, death, and the devil. And in our hunger, we grumble against God. We reject his kindness, grace, and favor. Why did you bring us out in the wilderness to die and eat this loathsome food? Sin does that to us, twists us inside out so that we prefer the food of slavery and bitterness over the bread of heaven. We’re like Elijah, weary and weak of life in a fallen world. Jezebel was after him; he had death threats; he couldn’t trust his best friends or family. So he sat under a broom tree in the wilderness and cried out: It is enough; now, O Lord, take away my life, for I am no better than my fathers. That sums up our wilderness wandering too. Like Elijah, we grow weary of life in this fallen world. Surrounded by Jezebels. Idolatry, immorality the new normal for our society. It’s easy to get an “Elijah complex” here in the wilderness, thinking we’re the only one who gets it. The last faithful Israelite. Such delusions come with malnutrition. Elijah had one thing right though. He was no better than his fathers. Same for us. We’re no better than Adam and Eve, Israel, or Elijah, or the crowds listening to Jesus’ bread of life teaching. Our spiritual hunger pains are a sign of a deeper disease. The hunger of sin and unbelief. That was the crowd’s reaction to Jesus’ teaching in John 6. They didn’t believe. They grumbled. “Our fathers ate manna in the wilderness.”Yes, they did, Jesus replied. And they died. Ultimately, our hunger reveals our Sin. Our lack. Our Emptiness. Our death. And it’s here, in our emptiness, hunger, and weakness – in our sin and death – where our Lord sets out like a Michelin star chef to fill, satisfy, strengthen, and save us. Clothing, shoes, food, drink, house, home, family. All of it from God’s gracious fatherly hand without any merit or worthiness in us, just as he did in the wilderness. Jesus fills our empty hands, bellies, and lives with an abundance of daily bread, but he does more. After all, manna couldn’t save Israel or us, it can only sustain us. For salvation, we must look to Jesus, the Bread of Life. For the bread that Jesus gives is not like the bread that fell from the sky for Moses or the bread that the angel brought Elijah. The bread that Jesus gives is Himself. Jesus is our living, life-giving bread from heaven. In Holy Baptism, he washes us and prepares us to come to his table as guests. In his holy Word of forgiveness in absolution, and in his holy body and blood broken and poured on the cross and on the altar, Jesus prepares a food from heaven that satisfies the deepest of our hungers, the hunger for righteousness. Jesus serves up a satisfying meal that no earthly food can offer, his very own flesh and blood. 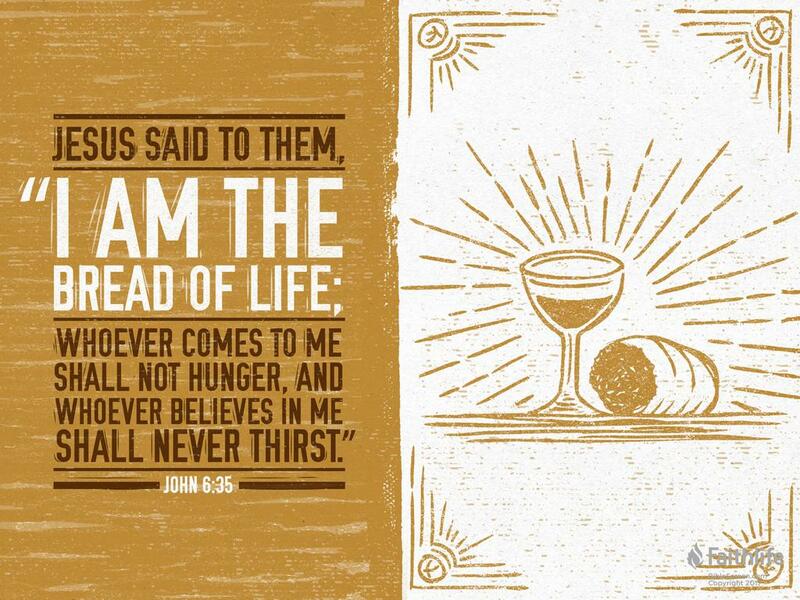 When Jesus says this it’s hard not to think of the Lord’s Supper. Indeed, we should. Blessed are you who hunger and thirst for righteousness, for here at our Lord’s table you are, and ever shall be satisfied. Christ our second Adam feeds us with the fruit from the tree of life, his body and blood given and shed for you for the forgiveness of sin. Christ our Passover Lamb is sacrificed for us and he offers up his blood to save us from the angel of death, gives his flesh to eat as the Bread of Life, and leads us out of slavery in the exodus of his death and resurrection. Christ, the angel of the Lord who once visited Elijah under the broom tree, visits, feeds, rescues us from death, and says to us, “Arise and eat, for the journey is too great for you.” I will make the journey for you. I will feed you. Take eat. Take drink. Sermon for Pentecost 11: "The Giver"
Oh…I know you think you're being generous, but the foundation of gift-giving is reciprocity. You haven't given me a gift, you've given me an obligation… So says Sheldon Cooper on the TV show The Big Bang Theory. That’s the way of the world: gift-wrapped karma. Give something to get something; it’s all over the marketing at Christmas or Valentine’s Day. In truth, it’ a bit more complex. Gifts are a part of our life, from baby-showers before we’re born to memorials when we die. The kinds of gifts we give say a lot about what’s important to us. Gift giving can also to bring out the best and the worst in us. At times, we give begrudgingly, half-heartedly, deceitfully, or selfishly. And yet we also give gifts out of love and thoughtfulness for others, selflessly and cheerfully even. Weddings, birthdays, Christmas, and the like. Today’s Gospel reading from John 6 is all about giving, and the God who reveals himself in giving. The verb “to give” is used at least 7 times in our reading this morning. In the feeding of the 5000 Jesus gave food freely. That’s why the crowds got in their boats, went to Cappernaum, and found Jesus. Truly, truly, I say to you, you are seeking me, not because you saw signs, but because you ate your fill of the loaves.They saw Jesus as their meal-ticket, not their Messiah. According to Jesus, there are two kinds of food in this life. Food for the body. Food for the soul. Physical life. Spiritual life. The food that perishes keeps death at bay, at least for a while. We have refrigerators, to keep food from spoiling, dying. The food Jesus gives, on the other hand, endures to eternal life. Jesus’ words are a gut-punch warning to us, just as they were to the crowds. This is just as Jesus intended, a death blow to the god of our belly, only not just our belly. But the gluttony of our every thought, word, deed, desire, and hunger that we fear, love, and trust in above God. This is what sin does to us, it curves us inward on ourselves. Navel-gazers Martin Luther called us. And it’s true. We have an insatiable appetite for destruction. We labor for food that perishes because, ultimately, we are perishing. It’s been that way since Adam and Eve ate in the Garden. Do not labor for the food that perishes. This isn’t Jesus’ Sea of Galilee diet plan. It’s a reminder that Man shall not live by bread alone, but by every Word that comes from the mouth of the Lord. A reminder that we hunger and thirst for righteousness, yet stuff our faces with all the rotten, junk-food this world has to offer. That even though we give with limits, terms, conditions, and strings attached, our Lord Jesus, the Great Giver, does not. His ways are not our ways. Jesus gives himself, his love, forgiveness, and mercy without limit, unconditionally, no strings attached, no terms, no deals, and no givesy backsies. Jesus gives his life for us freely, graciously, and abundantly in both body and soul. The LORD gave manna and quail to the children of Israel in the wilderness. Jesus gave bread and fish to the crowds on the hillside. Jesus gives us this day, and every day, our daily bread. That applies to our life of mercy to our neighbor: we who have more than we need give to others who don’t. Also to our lives as stewards: we give Thee but his own, whatever the gift may be, all that we have is Thine alone, a trust, O Lord, from Thee. After all, Jesus is the giver of all gifts, not Moses, not us. Jesus gives us our daily bread on our tables and his. Here Jesus gives us the bread of life in his body and blood. For the bread which comes down from heaven and gives life to the world is the Bread of God! Gift. Given. Giving. This is what Jesus does for us. This is who our Lord is. A gracious, superabundant, over-the-top, extravagant Giver. We see this in the feeding of the 5000. But we see it most clearly on the cross. For God loved the world in this manner, that he gave his only begotten Son, that whoever believes in him would not perish but have eternal life. That’s where Jesus’ Bread of Life discourse in John 6 leads us. To the cross, where we gather like dogs at the table, begging for scraps of blessings from our Master. Yet to our surprise, He gives us afeast instead. Jesus’ teaching in John 6 is a bread-crumb trail that leads us all the way from Capernaum to Calvary, from the feeding of the 5000 to the Passover with the 12, to the night in which he was betrayed, when he gave thanks and blessed the bread and the wine. Take eat, this is my body given for you. Take drink; this is my blood poured out for you for the forgiveness of sins. It’s an appetizer for the main course that Jesus prepares for us in His body and blood. 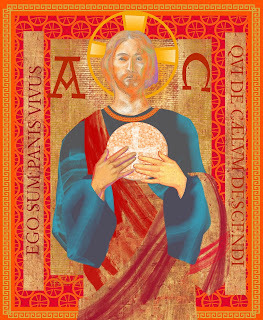 In this blessed mystery, Jesus is the bread of heaven come down to earth for you. Jesus feeds and nourishes us. God takes the stuff of his creation – wheat and wine – and he adds his Word and Promise to it. He does the same for us in Holy Baptism and Holy Absolution; he combines his word with his creation to give us the best gift of all, Himself. Sermon for Al Pfeiffer: "Contentment in Christ"
How can Jesus say that? Doesn’t he know we have bills to pay, meals to prepare, kids or grandkids to drive around town, not to mention a list of household chore that stretches to infinity and beyond? We know Jesus’ words (to his disciples, and to us) are true, even if they are hard to hear and perhaps harder to understand at times. Still, when the busy-ness of life takes over, when we see local and national disasters on the evening news, and when our own loved ones get sick and die, these words seem to be a bit easier said than done, don’t they? Anxieties. Worries. Fears. We know these all too well, and so did Al. He knew that life is hard work. He knew the pain of pancreatic cancer and the helplessness we experience when we’re sick. He also knew his sin just as we God’s Word reveals that we are weak, weary, and sinful apart from Jesus. But more than that, Al believed and confessed with St. Paul that, “I can do all things through him who strengthens me.” Christ crucified was Al’s strength in his weakness, as he is for you. Al believed and confessed with Isaiah, that, “the Lord does not faint or grow weary; and that the Lord renews our strength” in Jesus crucified for us. 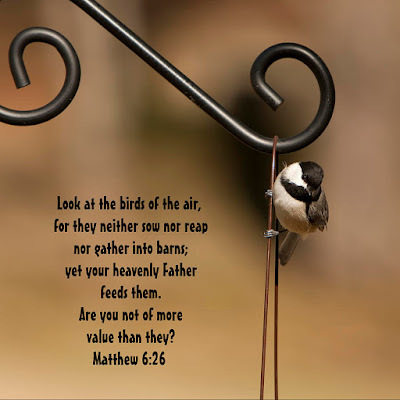 Al believed and confessed Jesus’ words in Matthew 6: “Look at the birds of the air: they neither sow nor reap nor gather into barns, and yet your heavenly Father feeds them.” For this reason, we pray, “Our Father”, knowing that God is our true Father and that we are His true children. Consider the lilies of the field, how they grow: they neither toil nor spin, yet I tell you, even Solomon in all his glory was not arrayed like one of these. But if God so clothes the grass of the field, which today is alive and tomorrow is thrown into the oven, how much more will he clothe you. What’s the common thread in these reading? Contentment. Sadly, I didn’t have the joy of getting to know Al. But from what I have come to know of him from Vicki and other members at Beautiful Savior, Al was content. Content in our Lord’s blessings in his earthly life: helping his neighbors, family, and friends; spending cherished time with his children, grandchildren, and church family; growing up on the farm in Minnesota, fishing, and taking a drive in his ’57 Chevy. What was the secret of Al’s contentment? Simply this: our contentment is found in the cross of Jesus. Our strength, like Al’s, is in Christ who knew no anxieties, worries, fears, or sin, and yet became our worry, anxiety, and sin and bore it all for us. That’s why Al was content in Christ’s promises to him in body and soul, even when that body was failing. In his last days, he knew what would bring him true and everlasting contentment; he asked Pastor Gerken to bring the Lord’s Supper for him in his last days. We need not worry about what we eat or drink, for the Lord who provides his body as bread from heaven, and his sacred blood with the wine will feed and care for us in the body as well. Al received true contentment in Holy Baptism as well. On October 17th, 1948, the Holy Spirit poured out his life-giving, sin-cleansing, grace-bestowing gift of washing and regeneration by the Holy Spirit. In that font at St. Peter’s in Swanville, MN, Al was clothed – as we all are in Baptism – better than all the lilies of the field, and all the kings of the earth. You are clothed with Christ, covered by his death and resurrection, robed in the righteousness of our Crucified King. 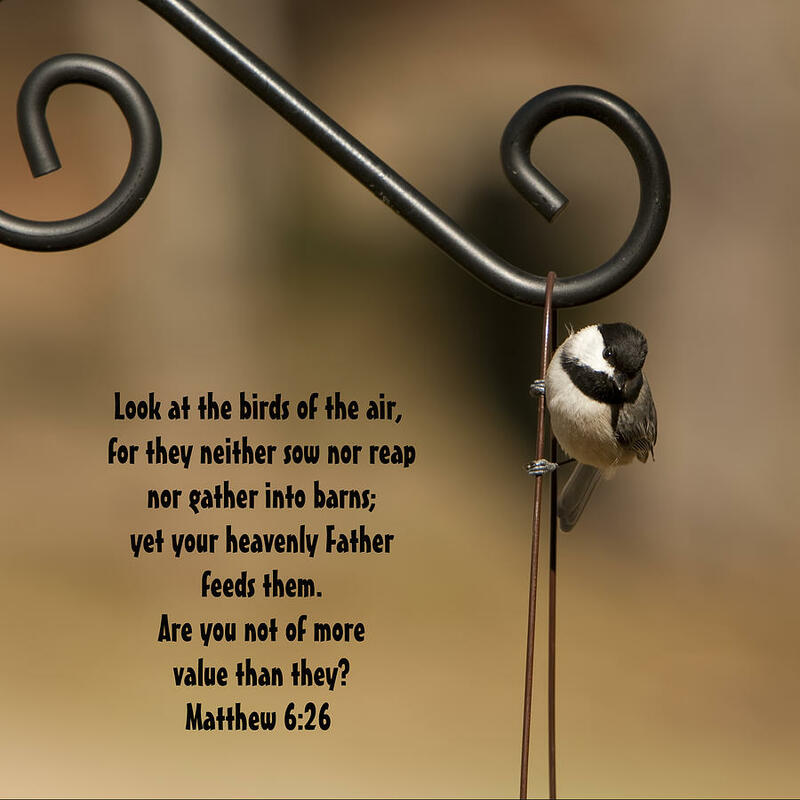 Indeed, we, Al, and all the baptized are of more value than the birds. So much so that our Lord took on human flesh for you, for Al, and for all. The Lord who does not grow weary or faint, became a helpless infant for you, wept at the grave of his friend for you, and became weak and faint to the point of death on the cross for you. Jesus also rose from the dead for you, so that our bodies, like Al’s, wracked by disease and touched by death would rise from the dead one day, just as Jesus did. The Lord who feeds the ravens when they call swallowed up death for us to bring us eternal contentment in the marriage supper of the Lamb. The Lord who is the Kingdom and Righteousness of God came to give you both his righteousness and his kingdom, freely. He clothed himself in our sin, threw himself into the blazing oven of God’s wrath, and bore every single one of our worries, anxieties, doubts, fears, and sins. That’s where our contentment rests. Not in our health, wisdom, wealth, or anything we say, think, or do. Our contentment is found in Jesus crucified for you. Familiar though this story is, St. Mark records Jesus doing a few strange things today’s Gospel reading. As the story begins, we’re told Jesus made, compelled his disciples to get into the boat and get a head start across the sea of Galilee while Jesus dismissed the crowds. Why does he send them off in such a hurry? Later, Jesus catches up with his disciples by walking upon the water as easily as we would walk the trail at Five Mile Lake Park. And if that wasn’t remarkable enough, St. Mark tells us that when Jesus walked on the water to his disciples, he would have passed them by. Only then, when the disciples saw Jesus, were they afraid.They were probably asking the same kinds questions we are: what’s going on here? What are we to make of all this? Or the good Lutheran question, what does this mean? To answer our questions, St. Mark tells us this story. But what kind of story is this? 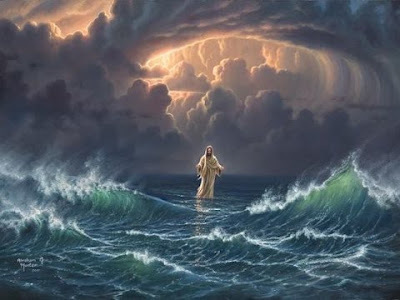 Is it an allegory about how Jesus comes to us in the storms of life and calms the troubled waters? It’s tempting to go that way. And while it’s true, Jesus is with us in all of life’s troubles as he promises, our Lord never promises that all of life’s troubles will end in this life just like the wind ceased once Jesus got in the boat. The promise is that Jesus is with us, comes to us as God in human flesh to save us, and that promise holds you no matter what is going on around. So, if it’s not an allegory, perhaps it’s a fable? You know... the moral of the story is…if we just had more faith, unlike those hard-headed, hard-hearted disciples, we wouldn’t be afraid when the winds of life blow adversity in our face. Problem is, if this was the right way to read this story, Jesus would never have gone to his disciples to comfort them in their fear; in fact, they wouldn’t have needed Jesus at all if they had everything figured out. So, what kind of story is this? It’s not an allegory that trivializes our pain and suffering. it’s not a moral story with a guilt trip the size of the Puget Sound. it’s a remarkable, yet historical narrative. A story where Jesus reveals who he is, what he has come to do for us, and how he is going to save us, just as he did the disciples. Jesus is in control of this whole scene from the beginning. He compels the disciples to go ahead of him. And then notice how he caringly, lovingly, like a Shepherd, dismisses the crowds. St. Mark depicts him like Moses caring for Israel in the wilderness. Here is the bread of life come down from heaven for you. After the crowds are gone, Jesus heads up the mountain to pray, just as Moses once ascended Mt. Sinai to meet with YHWH. Only here, YHWH in human flesh prays. Prays in grief over his cousin, John the Baptist’s death. Prays for the crowds to hear and receive him as the Messiah. Prays for his disciples to understand and believe. Prays for you, though no longer on a mountain, but as your great high priest in the heavenly sanctuary. St. Mark makes a subtle point here. There’s a separation between Jesus and his disciples. They were half way across the lake while Jesus was alone on the land. A physical separation, and a spiritual separation. God is God and we are not. God is holy and we are not. And yet, as we heard last week in the feeding of the 5,000, there’s something peculiar about this God-man Jesus, something unexpected, and even a little fearful, as the disciples quickly discover. Imagine the situation from the disciples perspective. There they were on the sea of Galilee; and for Israelites, the sea was always the place of chaos and danger, the home of Leviathan and the deep. It was somewhere between 3-6 AM (the 4th watch of the night). It was pitch black. The wind was howling. The boat tossing to and fro. The disciples were probably exhausted from fighting the headwind. And then they see something. Now every sailor I’ve known has at least one story to tell. But they all saw something. Only, it wasn’t a something. Someone. A man. Their master. The man Jesus. Walking on the water towards them. To make this scene even stranger, Mark uses that curious phrase “He meant to pass by them”. Is Jesus trying to play hide and seek? No. This is Mark’s way of telling us that YHWH has come to visit his own people. God reveals himself to us and for us. The Lord who passed by Moses in the cleft of the rock in Exodus, who allowed his glory to pass by Elijah in a cave now passes by his disciples on the sea. Mark wants us to know what the disciples didn’t understand on that boat: Jesus the man is the all-powerful God, the master of his own creation. And yet he comes to his creation with comfort, love, and mercy for us. Still, the disciples didn’t get it right away. They were afraid. They thought Jesus was a ghost. Sounds silly to us. It’s easy to point the finger at the disciples’ ignorance and foolishness, that is, until we realize we’re no different. We have fears, doubts, and failures just as they did. Mark tells us at the end of the reading that the disciples were utterly astounded and that their hearts were hardened, hearts of stone to use OT language. That’s our problem too. Like Israel of old we are a stubborn and stiff-necked people. We prefer to make God in our own image. To have a tame God we can control, or better yet, to put God on trial, to define God on our terms. There’s a word for that in Scripture. Pride. Idolatry. Sin. In the culture we live in, Jesus walking on water is a good reminder that he didn’t come to be our buddy, BFF, or our Bro. He’s the Lord of heaven and earth. The very Word of God made flesh, the visible image of God, and radiance of the glory of God. And most unexpectedly, and graciously, the Creator comes to his creation. The God of infinite cosmic power chooses the itty-bitty living space of Mary’s womb, and is born in a feeding trough for you. The God who told Job that He alone stretched out the heavens and treads on the sea as on a bed, walked on water revealing himself to the disciples. And with those same feet he walked to the cross bearing our fear, doubt, pride, sin, and death. The God who made a pathway through the waters for Israel makes a new exodus for us through the waters of Holy Baptism. The Lord who made a covenant with Noah and all creation pours out a lavish flood of forgiveness over us here in his holy Ark, the church. You are saved through the water, just as Noah, Israel, Jonah, and the disciples were. And the truly remarkable thing is that Jesus does all of this even though the disciples didn’t deserve it and didn’t get it. Just like us...by God’s undeserved, unmerited, unconditional grace. Oh, give thanks to the Lord, for he is good and his steadfast love endures forever. Take heart. Be of good cheer. It is I, Jesus said. Do not be afraid. Jesus got into the boat with them, and the wind ceased. Jesus didn’t abandon his disciples, and neither will he abandon you. He is the King of creation, but also the crucified king for you. And even though the disciples didn’t get it then, they would. They saw Jesus crush the head of the great Leviathan on the cross. They saw the blood and water pour forth from his pierced side. They saw Jesus alive again, not as a ghost, but with nail marks in his hands and side, for them and for you. Do not be afraid. Peace be with you.